A sunk cost is an irretrievable cost. Once spent, the sunk cost cannot be recovered when the firm leaves the industry. A sunk cost is incurred in the past and cannot be changed. A non-sunk cost are costs that will only be occured if a particular decision is made. Advertising expenditure. If you advertise a new product, that money is gone and cannot be retrieved. Research into a new product. If the product doesn’t work out, you are left with nothing you can sell on. Labour costs. If a firm sets up a new business, it will need to employ people to work and manage, these costs cannot be recovered. Installation of a new software system and working practices. Loss of reputation and business connections. If a firm closes down, then it will have a negative impact on its reputation, it will also lose regular customers who shop out of habit. This is why even in a downturn – the firm may want to try keep going – despite making a loss. Land If a firm buys a plot of land and then leaves the industry, the land can be sold and some or all of the costs recovered. Capital. If a farmer buys a combine harvester, then if he leaves the industry, the combine harvester can be sold. He may incur some economic loss. (resale price is less than original purchase prices). But because it can be resold means it is not completely a sunk cost. If an industry has high sunk costs – then this creates a barrier to entry. A firm will be more reluctant to enter the industry if it needs to spend a lot of money – that it can’t get back if it needs to leave. This is why incumbents might spend a lot on advertising – to create stronger brand loyalty. For example, Coca-Cola and Pepsi both have huge advertising budgets. This makes it very difficult for any new firm to enter the market and produce their own cola. Market contestability. High sunk costs mean that the market will be less contestable – and existing firms are protected from the threat of entry. Once sunk costs are spent by a firm, these shouldn’t influence their decisions at the margin. For example, if a new product is experiencing marginal costs higher than marginal benefit, then it is making an operating loss. The rational action is to close down. 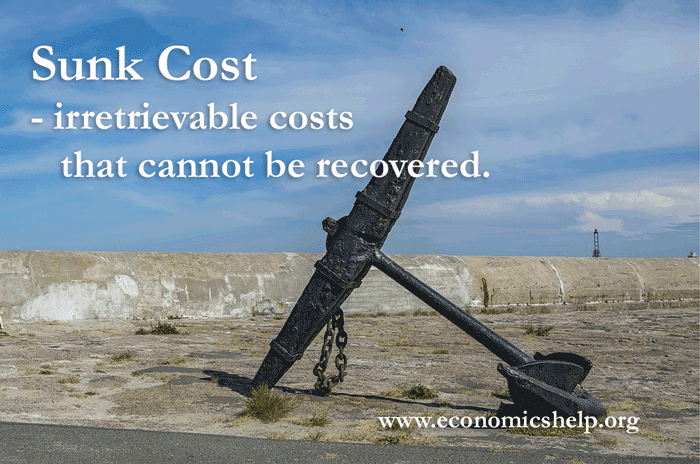 The sunk costs shouldn’t come into the equation because they are gone. However, behavioural economics suggests that individuals may have an attachment to the past sunk costs – because they spent $100million on a new software system, they want to try and make it work. This is known as loss-aversion.